Before an interior painting project, any minor damage to drywall should be repaired. Sharper Impressions provides drywall repair services so that you don’t have to worry about making home repairs before we come in to do the wall, trim or ceiling painting you need. Repairing dents, cracks and holes in your walls will provide a finished look to your home and help the paint look better and last longer. 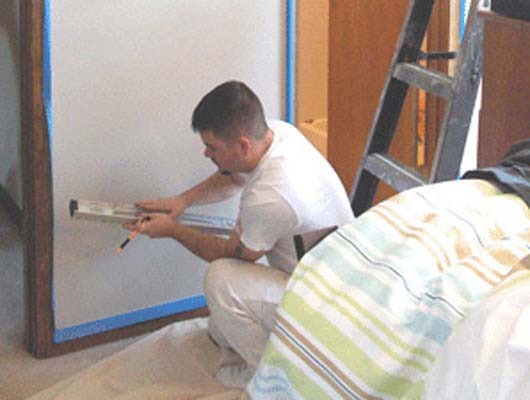 Paint will resist chipping and will stay smooth on repaired walls. We don’t just make a temporary fix to your damaged walls, we provide a solution. With any repairs made on your home, no matter how minor, you want to know that the service you are hiring is honest at all times. When you work with Sharper Impressions, we promise you will get a fair and competitive price upfront. Your drywall repair quote will be exact and detailed, and will include written explanations of what steps are necessary to keep your home looking great and lasting for decades to come. Looking for drywall repair services to give your home a fresh look? Call Sharper Impressions Painting today to schedule a free estimate, or request a free quote by filling out the form below!